The E.W. Kent Manufacturing Company was established in the latter part of the 1940s by two brothers, Ed and Bill Kent. 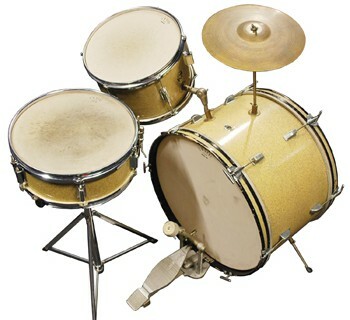 Located in Kenmore, New York, they produced American-made, inexpensive quality drums until the late 1960s. The company offered two primary lines of drums, their Deluxe Professional line and their Economy Professional line. In addition to drums used for drumsets, they made parade (marching) drums and tambourines. Near the end of the company’s history, the Kent brothers began to import shells and other parts from Japan, ending its “Made in the U.S.A.” identity. 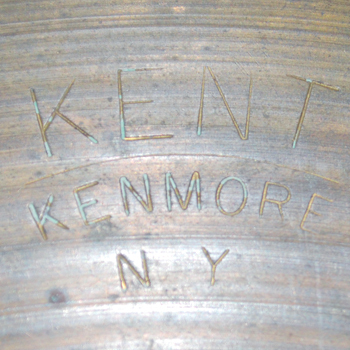 In addition to marketing drums with the E. W. Kent brand name, the firm also manufactured drums for other companies with brand names such as Paramount, Revere, and Musketeer. This complete “outfit,” No. 1500, was sold ready-to-play with all drums, hardware, and cymbalA copper/bronze (or variation of metal alloy) disk struck with a drumstick or crashed together .... The outfit is comprised of a 5 ½ x 14 inch snare drumOne of the more common drums in marching bands and drumlines and the primary drum of a drum set..., 9 x 13 inch tom, 14 x 22 inch bass drumThe lowest pitched drum in a marching band or with a drum set. A two-headed drum, it is usually..., a 12-inch Kent “Turkish-type” cymbal, bass drum pedalThe pedal used to play the bass drum on a drum set. , snare stand, tom mount, cymbal post, sticks and brushesA type of mallet that consists of fanned-out wire bristles and are typically used in jazz drumm.... The outfit also features Kent’s ratchet design tom holder, chrome-plated hardware, disappearing bass drumA hollow cylindrical shell of any size that has a head stretched over one or both ends and is b... spurs and cymbal post, and Remo Weather King drumheads sold with the E.W. Kent brand name. All drums on this outfit have six lugsThe tension rods (or screws) that hold the hoop and drumhead onto the drum. with separate tension for each head and two-ply, maple shells. The drums are covered with “silver sparkle” wrap, which has changed color due to the normal process of aging with this type of material. The snare and tom each have a single, center-lug design with triple-flanged hoops, but the bass drum has separate lugs for each head and wooden hoops. 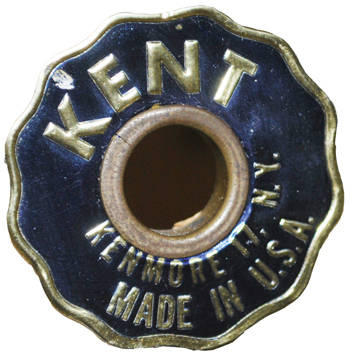 Though the snare drum has Kent’s early strainer, the blue, aluminum badge suggests that this set was manufactured in the latter part of the company’s operating years, probably the early 1960s. The snare stand, now a Hamilton brand, is not part of the original outfit.